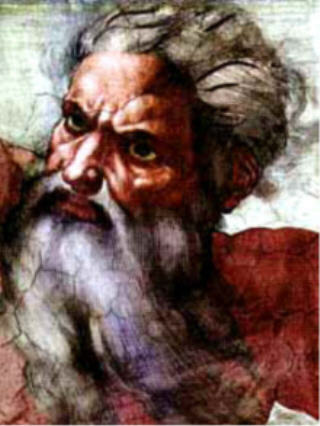 “In what particular does the jealous, wrathful, revengeful God of Israel resemble the unknown deity, the God of mercy preached by Jesus; – his Father who is in Heaven, and the Father of all humanity? This Father alone is the God of spirit and purity, and, to compare Him with the subordinate and capricious Sinaitic Deity is an error. Did Jesus ever pronounce the name of Jehovah? Did he ever place his Father in contrast with this severe and cruel Judge; his God of mercy, love, and justice, with the Jewish genius of retaliation? Never! From that memorable day when he preached his Sermon on the Mount, an immeasurable void opened between his God and that other deity who fulminated his commands from that other mount – Sinai. The language of Jesus is unequivocal; it implies not only rebellion but defiance of the Mosaic “Lord God.” “Ye have heard,” he tells us, “that it hath been said, an eye for an eye, and a tooth for a tooth: but I say unto you, That ye resist not evil: but whosoever shall smite thee on thy right cheek, turn to him the other also. Ye have heard that it hath been said [by the same “Lord God” on Sinai]: Thou shalt love thy neighbor, and hate thine enemy. But I say unto you; Love your enemies, bless them that curse you, do good to them that hate you, and pray for them which despitefully use you, and persecute you” (Matthew v.). “Resignation, the action of tendering good for evil, temperance, probity, purity, repression of the senses, the knowledge of the Sastras (the holy books), that of the supreme soul, truthfulness and abstinence from anger, such are the ten virtues in which consists duty. … Those who study these ten precepts of duty, and after having studied them conform their lives thereto, will reach to the supreme condition” (Manu, book vi., sloka 92). “If Manu did not trace these words many thousands of years before the era of Christianity, at least no voice in the whole world will dare to deny them a less antiquity than several centuries B.C. The same in the case of the precepts of Buddhism. 1. Thou shalt not kill any living creature. 2. Thou shalt not steal. 3. Thou shalt not break thy vow of chastity. 4. Thou shalt not lie. 5. Thou shalt not betray the secrets of others. 6. Thou shalt not wish for the death of thy enemies. 7. Thou shalt not desire the wealth of others. 8. Thou shalt not pronounce injurious and foul words. 9. Thou shalt not indulge in luxury (sleep on soft beds or be lazy). 10. Thou shalt not accept gold or silver. See also The True Nature of Jehovah and Dismantling the Christian Edifice.